GripTight Fitment Guide – Which GripTight do I need? The following guide below is designed to answer most GripTight sizing questions you may have. 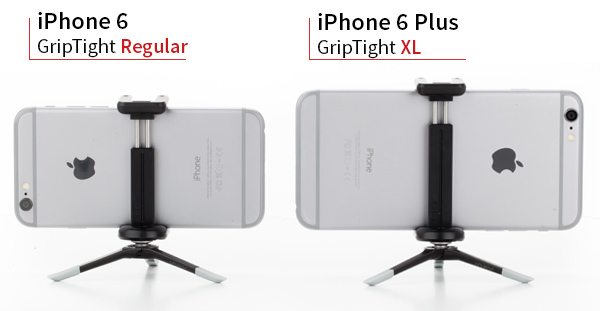 With or without a case, iPhone 6, iPhone 6 Plus or Android, we have the right GripTight Mount for your smartphone. 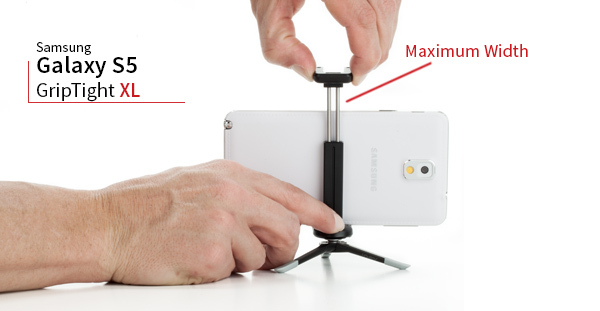 Adjustable grip fits smartphones between 2.1-2.8 in | 54-72mm wide. Adjustable grip fits smartphones between 2.7-3.9 in | 69-99mm wide. 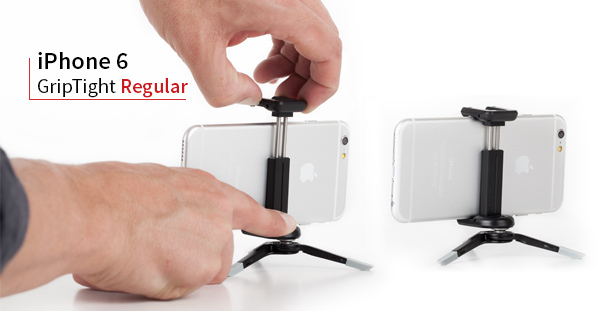 From the iPhone 4 to the 6 Plus we have a GripTight Mount for your current Apple smartphone of choice. The images in the guide below will help you choose which size GripTight is right for you. iPhone 6 – GripTight Regular recommended without a case. NOTE: GripTight XL will work, see images below. 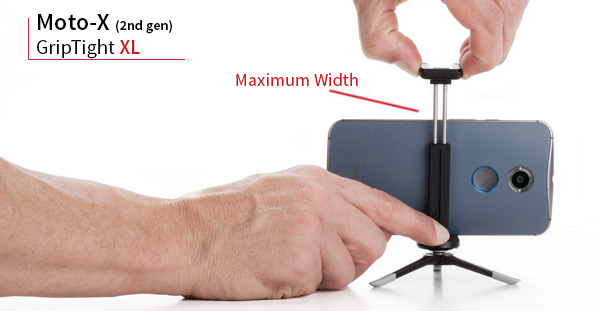 iPhone 6 Plus – GripTight XL recommended without a case. 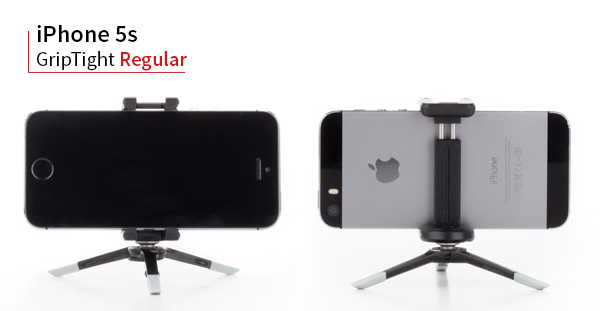 JOBY GripTight Regular the perfect smartphone mount for the iPhone 6. 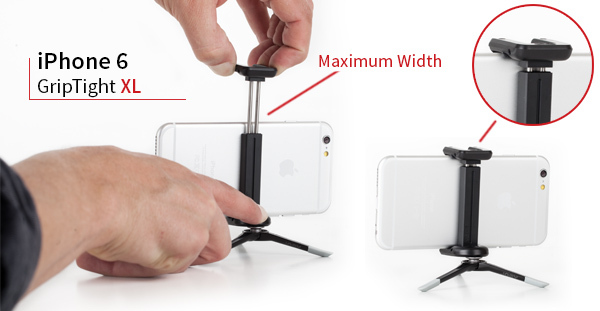 While the JOBY GripTight XL will work for the for the iPhone 6 without a case the Regular size is recommended for a tighter grip. The OtterBox Defender case is massive and is the largest case we could find for the iPhone 6. The GripTight Regular fits but just barely at it’s maximum opening width. Your case probably isn’t this large. With a case we would recommend the Regular size for the iPhone 6. NOTE: If you do have the OtterBox Defender case you should use the GripTight XL. 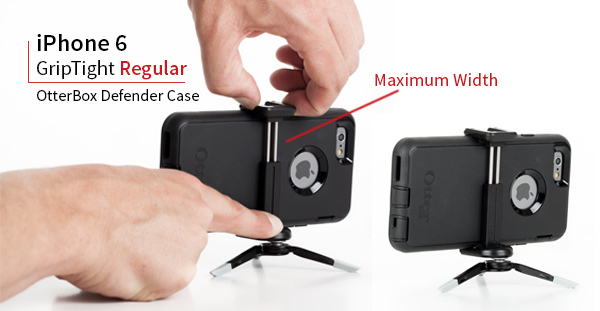 The JOBY GripTight XL if perfect for the iPhone 6 Plus with or without a case. It even fits easily with the massive OtterBox defender case. On the Android side there are a few more options of smartphones to choose from, yeah! We have a few sizing examples of the current leading Android mobile phones (as of 2/15). The Moto-X 2nd Gen is 2.85in | 72.4mm wide. Fitting both the GripTight Regular and XL fit. If you have a case or not will depend on which is best for you. See the images below. 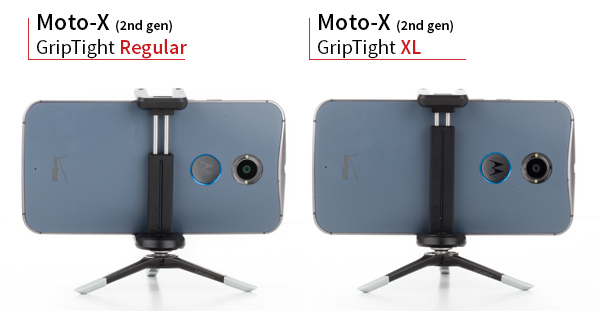 Recommended – The GripTight XL fits the Moto X 2nd Gen with plenty of space between the jaws. Perfect for use with or without a case. Possibly Recommended? 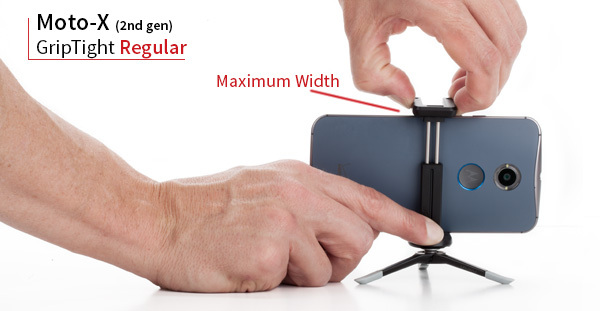 – The GripTight Regular fits the Moto X 2nd Gen with a small amount of space to spare between the jaws. This is preferred by some of our JOBY staff as it provides a very snug fit. Only recommended without a case. The Galaxy S5 is 2.85in | 72.5mm wide. The GripTight XL is recommended and has plenty of room for most cases. The Galaxy S4 is 2.75in | 69.8mm wide. Without a case we recommend the GripTight Regular. With a case we recommend the GripTight XL. Galaxy Note 3 is 3.12in | 79.2mm wide. 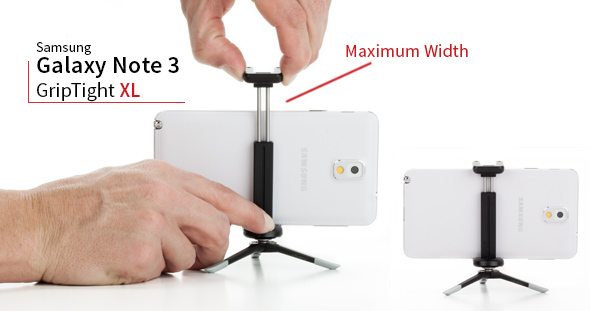 The GripTight XL fits the Note 3 & 4 perfectly and has plenty of room for most cases. Under 2.8in | 72mm wide use the GripTight Regular. Over 2.8in | 72mm wide use the GripTight XL. iPhone 4, 4s, 5, 5s with a case use the GripTight Regular. 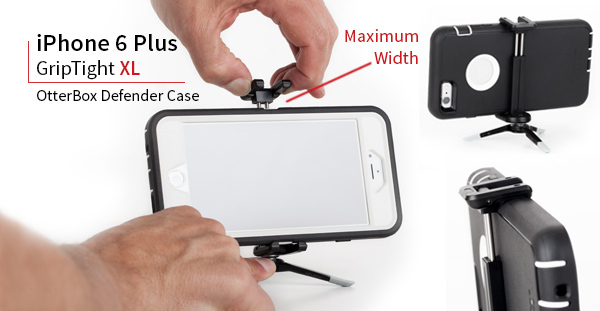 iPhone 6, 6 Plus and similar size Android smartphones with a case use the GripTight XL. Don’t see your phone? Still have a question? First see if a phone above is a similar size to yours and follow the guide for that phone. If you still have questions email us at community@joby.com and we’d be happy to help.